Puffy Tacos - my favorite way to eat tacos! 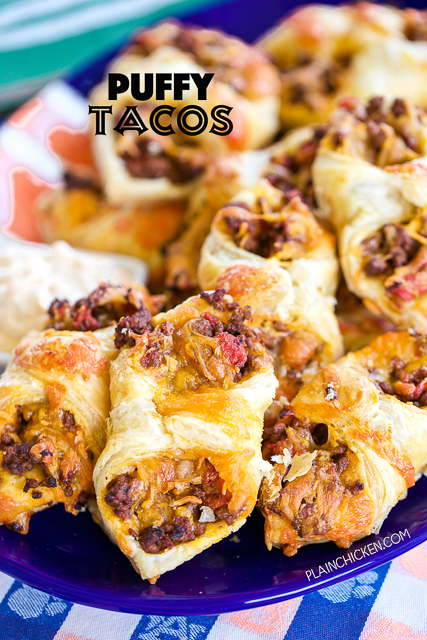 Only 5 ingredients - hamburger, taco seasoning, diced tomatoes and green chiles, cheese and puff pastry. Ready to eat in minutes!! Can make ahead of time and freeze for later. Great for tailgating and parties! These Puffy Tacos are my new favorite way to eat tacos. They were SO good! We dipped them in some salsa, ranch dip and a combination of the two. These Puffy Tacos taste great right out of the oven or at room temperature. We even reheated the leftovers for lunch the next day. They tasted great every time. There are only 5 ingredients in these Puffy Tacos and they only take a few minutes to assemble. The best part about these Puffy Tacos is that you can assemble them ahead of time and freeze them unbaked for later. Perfect for tailgating and holiday parties! Preheat oven to 400ºF. Line two baking sheets with parchment paper. Set aside. In a large skillet, cook ground beef until no longer pink. Drain. Add taco seasoning, diced tomatoes and green chiles and water. Simmer for 5 minutes. Set aside. Arrange taco meat down diagonal center of the pastry squares. Sprinkle with some of the shredded cheddar cheese. Fold two opposite corners of each square over the filling and press edges to seal. Place on prepared baking sheet. Looks like a delicious little treat. We had your southwestern chicken spaghetti last night and loved it - blog post coming in a few days. Made these tonight and didn't have enough puff pastry but I did have phyllo! 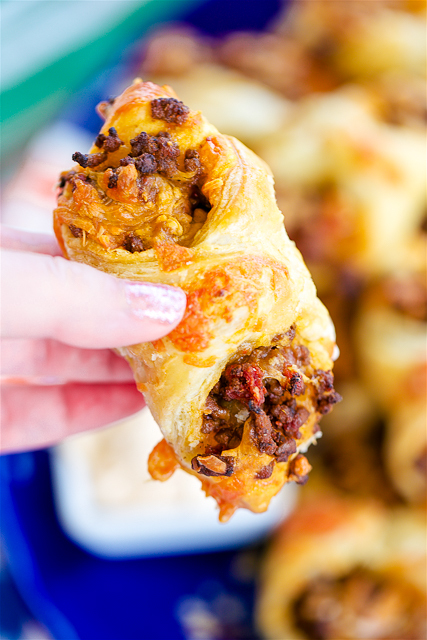 Using two sheets of phyllo for each, the taste of the beef came through so much better than the puff pastry. I'll make it again but will only use phyllo! Very easy and super tasty! I will make these again! Served with picante sauce! If you freeze them for later do you unthaw them before baking. Also, do you bake at the same amount of time and oven setting? I usually thaw them before baking. It doesn't take much time for them to thaw. Stephanie, I made these yesterday and boy, are they ever good. But my question is, is there a trick to holding the pastry together? The first batch I made they all came open. Second batch I was able to somewhat correct the problem with that. Do you just pinch the dough together or is there a trick? I will be making these a lot. so good. A little water on the bottom corner and then pinch them really good. You can also stick a toothpick in there if you are still having issues. Usually the water on the bottom corner works for me.